Working with the code sample at "Use an Outlook Macro to Send Files by Email", a user, gvg wanted to know how to embed, instead of attach, pictures. Is there a way to send picture as email body instead of text much like one does it manually with Insert-Pictures in Outlook? With a few tweaks to the first macro on that page, we can embed the images. Namely, we needed to use PropertyAccessors to set properties for the mime type, the cid that identifies the image, and to mark the attached image as hidden (recipients may still see the paperclip and the attachment). This code should work with Outlook 2007 and newer; it will not work with Outlook 2003. 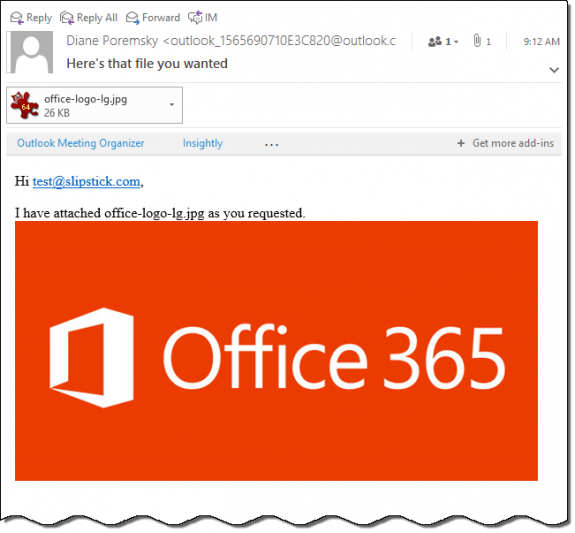 I tested it in Outlook 2016. To use, change the path where the pictures you want to send are stored and change the To address. This macro sends one message for each picture in the folder. It sends all of the pictures in the folder. "Outlook macro to send files by email" has other examples which can adapted to use with this macro. .Subject = "Here's the files you wanted"